Prior to the opening of Ellis Island in 1892, most immigrants into the United States came through Castle Garden. Castle Garden functioned as the first immigration center for the United States from 1855 until 1890. Peter Nielson came through Castle Garden as an immigrant from Denmark in 1870. He made his way through New York and settled in Lansingburgh. He was a tailor and eventually owned his own dry goods store. Along with his wife Martena, he raised five children including Emma. The story of American immigration is complex and diverse. It is a story best told through multiple perspectives using the evidence left by those who experienced it. Emma Nielson was the daughter of immigrants from Denmark. Her parents immigrated to the United States in 1870 and Emma was born in 1876. The story of the Nielson family is not unlike many immigrants from the Northwestern European countries. However, when compared to the experiences of immigrants from Southeastern Europe, Asia, and Latin America, the Nielson story is vastly different. A close look at the Nielson experience shows the relative ease in which this family immigrated and established a new life in the United States. Emma's student journal provides a glimpse into everyday life in Lansingburgh, New York. Her account of the Blizzard of 1888 shows a young girl's perspective regarding an extraordinary event. What is the American immigrant experience? Describe the scene in this photograph. 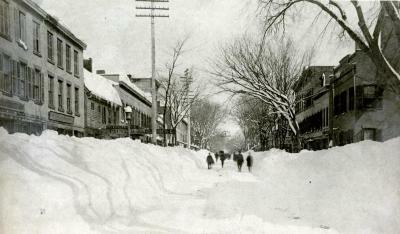 Photograph of a Street in Lansingburgh, New York following the Blizzard of 1888. How would you describe the people in this photograph?